Like Merchant Ships: What A Hoot! For several years now, it's been trendy to sport a scruffy, vintage look...but now Target takes the cake. Look at the "Thrift Shop Hippie Chick" Bedding Collection in today's flyer. They actually use the term "thrift shop" in the name! Sweet vindication for those of us who are original thrifters, isn't it? I can grab odds and ends and through them together and spend less than 10% of the cost of that collection of misfits. Those Target prices sure aren't thrift shop prices! Just think of allllll the stuff we could buy at our thrift shops and garage sales for that amount!!!!!! We sure can have the last laugh in that we wouldn't pay that for bedding. But give it time...a lot of stuff in Target ends up on the clearance rack in time and then you can get a pretty good bargain on it. You're absolutely right! Here our Target donates clearance to Goodwill stores. 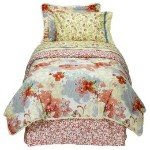 Wouldn't it be hilarious to buy a set of the "Thrift Shop Hippie Chick" bedding AT a thrift shop? I did just pick up 3 brand new very plush Target hand towels at Goodwill for 99 cents a piece.